Lawmakers and supporters of Pakistan's opposition Party Pakistan Muslim League headed by ousted prime minister Nawaz Sharif, stage a protest outside Parliament House in Islamabad, Pakistan, condemning the arrest of their leaders, Oct. 11, 2018. They demanded the immediate release of their leaders and criticized the Imran Khan's government, seeking loan package from the International Monetary Fund. IMF team to visit Pakistan after request for bailout loans. 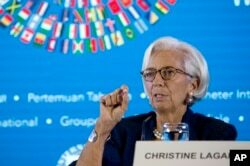 “An IMF team will visit Islamabad in the coming weeks to initiate discussions for a possible IMF-supported economic program,” an IMF statement Thursday quoted Lagarde as saying. “We look forward to our continuing partnership,” she added. In addition to an IMF bailout package, Khan said, the government is also seeking temporary loans from “friendly countries” to bridge the funding gap and boost Pakistan’s depleting foreign exchange reserves that hit a four-year low of $8.4 billion last week. “We will get out of this. I will take (the country) out of this (crisis),” the prime minister, who took office in August, vowed in nationally televised comments. FILE - Pakistan's Prime Minister Nawaz Sharif speaks at the inauguration of the China Pakistan Economic Corridor port in Gwadar, Pakistan, Nov.13, 2016. Critics have cited, among other factors, China’s infrastructure loans to Pakistan as part of an economic development program Beijing has launched in its South Asia ally as part of President Xi Jinping’s global “Belt and Road Initiative” (BRI). Critics say an IMF program would lead to increased utility bills, rising taxes, further depreciation of the rupee and a slowdown in economic growth. The measures would undercut Khan’s election promises, including 10 million new jobs and the establishment of a “welfare state” during the government’s five-year mandated term in office. “This is a very small period (of crisis). Our country is a rich country, it is blessed by Allah. This country will come out of crisis,” he said. Khan went on to announce an ambitious massive nationwide low-cost house scheme with the aim of building 5 million homes in the next five years.